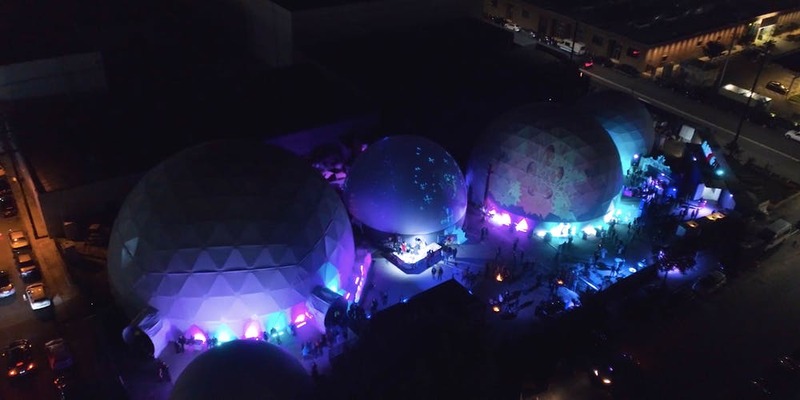 An aerial view of Wisdome L.A.’s geodesic domes. 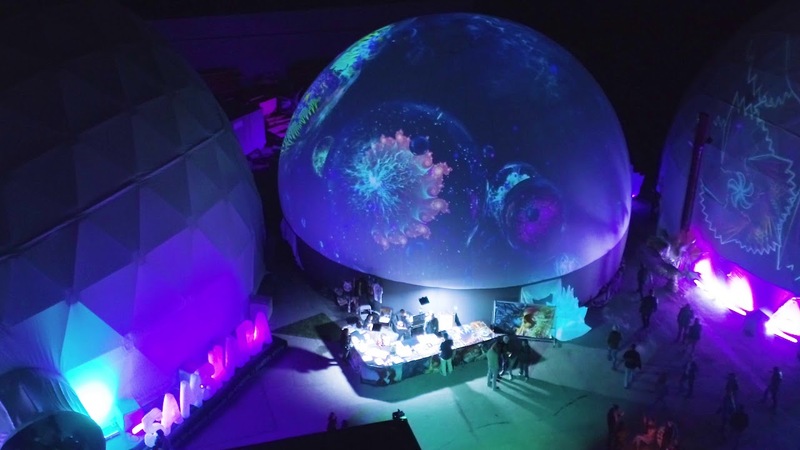 LOS ANGELES, CA — The LA Arts District has a new kid on the block: Wisdome LA, which is an impressive 35,000 square feet space filled with 5 huge immersive domes featured at the likes of Coachella, Burning Man, and Lightning in a Bottle. What’s inside? It’s tough to explain in words, but we’ll do our best. WHEN: All of 2019, but check the schedule on https://wisdome.la for scheduled events. Stuff in LA sent some reps to check out Wisdome L.A. simply because it was hard to figure out what the whole experience was about just from reading about it. It was clear that this is something that needs to be checked out in person to really understand the whole point and vibe of the experience, and we will admit it was pretty unforgettable. The experience is grounded by Samskara, the name given the art exhibit created by Android Jones, who participated in the Grateful Dead Fare Thee Well Tour and has had his work been projected on the Sydney Opera House and the Empire State Building. Jones created over 70 pieces of artwork in 9 different formats for Wisdome L.A., and our representatives described them as super colorful, trippy, detailed, Avatar-like, and just generally tough to look away from. These captivating pieces of art are very photogenic, and it’s a good thing to do with some friends or a date. Example projection found at Wisdome L.A.
At one point, our representatives were lying on the ground staring above at the projections on the dome along with a bunch of other folks attendees in a shared communal experience of seeing Jones’ work projected on the screen. Robots, strange other-worldly creatures, androgynous figures, and insane designs filled the dome; it was like a dream in real life, essentially. As if the art wasn’t enough, there are VR experiences where attendees can literally put on VR headsets and traverse through other worlds. The one Stuff in LA tried involved walking through some sort of distant land and using controllers to fire off insane patterns. It was disorientating in a positive way; it also was funny to watch each other look silly. In between domes are a wide variety of food trucks and booths as well as general item sellers such as CDB soap and gummies. Definitely an eclectic offering that will satisfy many goers, and we found that it was a nice touch to add to the overall variety and give the park sort of a “theme park” feel. 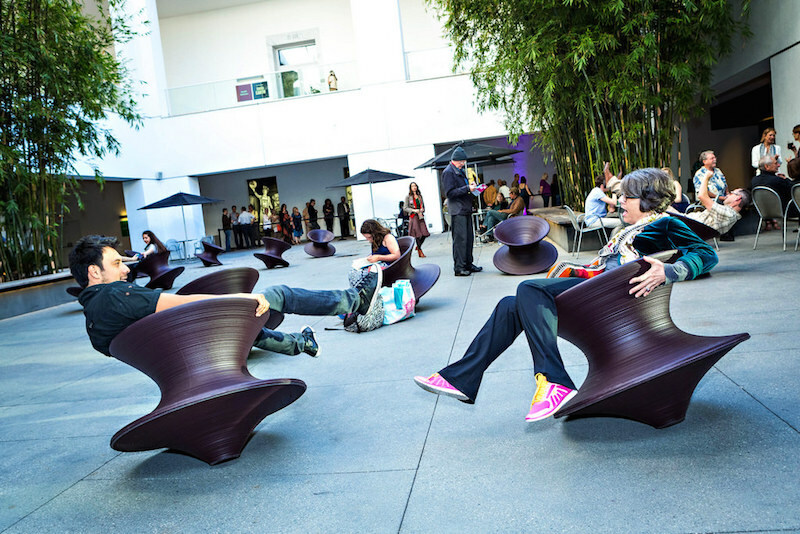 While the more permanent fixture of Jones is definitely to be seen, what really shines about Wisdome L.A. is the sheer variety of events they host. The full schedule of events can be seen on their website, but some notable ones we saw on first glance were a dance party (Samskara x Ecstatic Dance LA with Porangui & Raio), a cast & crew Q&A of the cult classic 10 Things I Hate About You and impromptu prom (Special 20 Year Anniversary of 10 Things I Hate About You), and a yoga/art hybrid experience (luminhero x samskara – immersive workout and art experience). The shows really do range, when we went, there was a live performance of the music of Pink Floyd which attracted a lot of faithful fans. More information about Wisdome can be found on their website, and tickets plus additional details for attendance can be found on Eventbrite. Wisdome is currently open from Thursday-Sunday each week starting at 11am and running until 11pm on Thursday and Sunday and until midnight on Friday and Saturday.